Hi everyone! I hope you all had a good week! I had a lot of fun at the Botanic Gardens last weekend. It was so much fun talking to everyone about bats. A lot of people came by and the bats loved all the attention they were getting. They also liked all the juicy mealworms that they got to eat. A few days ago, Save Lucy shared an article. I thought it was really interesting. The article was about how bat pups pick up bat dialects. A team of scientists wanted to know if bats could pick up other bats’ dialects when introduced to them. They raised 14 little bat pups with their mothers. The bats were all from different colonies. The scientists played three subsets of recordings of natural bat sounds. This continued until the pups were adults. Since the pups were raised with their mothers, they learned to speak like she did, but with the introduction of other bat dialects via the speakers, they also learned how to speak in the dialect the speaker was playing. Isn’t that cool? Until this study, scientists thought humans were the only ones who could pick up different dialects. People have different accents and dialects depending on where they are from. Over time, people learn how to copy others’ accents or to drop their own accents in order to communicate. If you would like to read the article, you can find it here. Daylight Savings time ends tomorrow. Don’t forget to set your clocks back an hour. Also, Election Day is Tuesday. Don’t forget to vote. 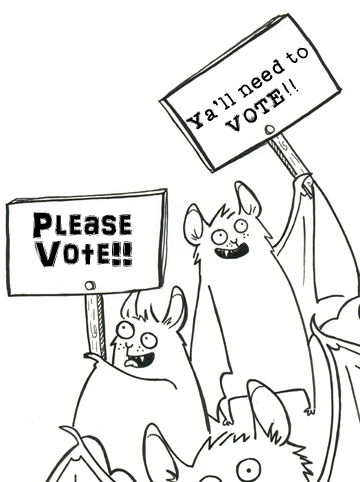 The little bats are counting on their human friends to do all the voting for them. Sadly, bats aren’t allowed to vote. Next StoryA beautiful, superheroic city!